“Swab Master” Swabbing rigs are Fast, Powerful, Easy To operate and maintain. Best of all they are Field Proven to Work hard and live long Productive Lives. 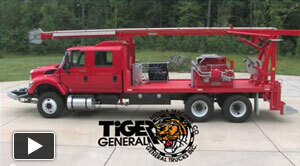 Since 1925 Tiger General swabbing rigs were considered rugged and dependable. We have been Relentlessly improving our Machines ever since. In 1978 we delivered our first Direct Drive Hydraulic Swab Machine. We thought we were Pretty smart,…….It took us until about 1988 to deliver machines that We could look You in the eye and say. These machines will do everything we say. If not we would Buy them back…. We never bought any back. Lots of the early hydraulic machines are Still working today. We have a passion to build Well Engineered Premium Quality Swab rigs. Ask around. Tiger General Products are Field Proven to Work Hard and live Long Productive life. They are backed up By Rock Solid After Sale Support. Here’s why Tiger General Delivers your Best Value. If you are a contractor or producer the facts are the same. Our customers report that a regular swabbing program dramatically increases your production income. Why mess around with only half-measures such as soap and rabbits. If you need to reduce cost and increase production, we can help. Don’t let the size fool you. If you need to go to 16,000 feet, No problem. We will Deliver. I want to put a smile on your operators face, and happiness in your wallet, (not the “feds”) Make More Money and Take the Deductions. The Feds will just flush your tax money anyway. Invest in the Best. 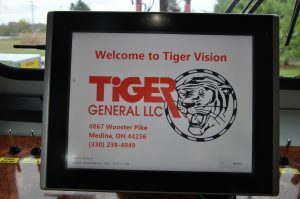 Tiger Vision: Tiger Vision is a Tiger General, LLC Patented Proprietary hardware/software data acquisition and monitoring system built on Microsoft Windows platform. It utilizes a standard solid-state touch screen computer to record, save, and display on screen incoming Swab Master and engine electronic data. 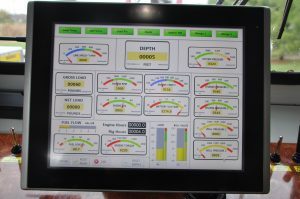 The data is displayed using sweeping analog/digital color-coded gauges for the operator to monitor in real time truck engine and rig operating systems. 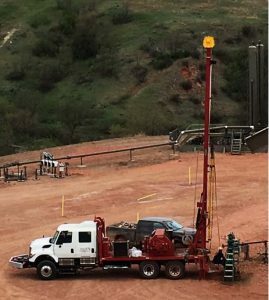 This system provides the operator with downhole information such as depth (in and out of the well), line speed, gross and net loads, system pressures, charge pressure, tubing and wellhead pressures. Data output for the gauges can be selected and shown on the display in either English or Metric. Programmable depth alarm warning horns are used to indicate when tooling is reaching the top of the well with warning light indicators. Set up is easily done with the help of Configuration screens. All data can be downloaded to the laptop or mobile devices. The computer comes with the keyboard, powered with a 12V to 110V inverter, with a battery power back up. Optional Data Logging Streams data to allow anyone you choose to view the data in Real Time and print out on spreadsheet report, Anywhere in the world. All you need is an internet connection. Production engineers can stay home. What do the other guys offer??………. Not Much. 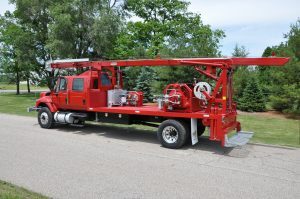 The swabbing rig operator might make one run or many runs to “clean up”, “unload” or “dry up” the fluids in the well. a “run” is one cycle in and out of the well. All wells act or react, differently. In the past, the swabbing rig operator guessed, based upon his personal experience, where the fluid is. Usually, buy sounds and seeing a little slack in the cable as to when fluid is “hit.” He might use a hand depth counter, but that is dangerous because another person needs to hold the hand wheel on the moving cable. 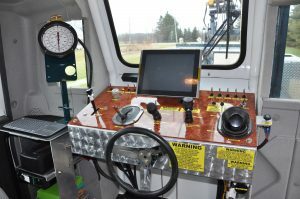 Tiger Vision eliminates the danger of possible personal injury from an operator getting caught in the moving cable while using hand counter wheel. Tiger Vision and Tiger Logging helps you get maximum loads every run. It helps take the guessing out to avoid those runs that come up empty. Tiger Vision is a Patented proprietary tool to increase efficiency and safety, By delivering downhole information that will aid the operator, engineers and well owner. Tiger Vision Logging. Each line item action is logged and time stamped. Special important feature. If load sense gauge shows insufficient loads at start back up, the operator can stop. Go down deeper to get maximum fluid loads per run. Logs new start back up point. Logs new start-up point depth. Beginning when you get to well sight. Start swab master rig When you start the rig the clock starts to run to log time of operations At start or top of well, Zero out Depthometer. Start falling into the well As tools fall into the well, the system displays depth and loads As tools fall into the well, the weight or load indicator show increases as more cable weight falls into the well. When the tools “hits” fluid, The weight indicator changes before any other indicators. The logging system notes this point. Now the operator knows exactly how deep he is into the well. The system logs, where the fluid is hit, It is noted at each run. This is very important information to the well owner or operator to evaluate downhole or well status information. With this information, the operator decides how much further to go into the well, or how long a column of fluid to “get” or lift up and out of the well. The Depthometer tells the operator where the tools are in the well. Example. The operator might decide, (based upon experience) to “get” 1000 ft. Of fluid in 2” tubing. With Tiger Vision, the operator can go exactly 1000 ft. into the fluid. Then start back out or up and out of the well with the column of fluid. Unloading the fluid out the discharge line at top of well. Tiger Vision logging notes the depth where fluid first hit, how far down to stop or up point, load pulled at the start point, depth to the top of well. At the up point, the operator will start out or up about 20 ft. Then check the tiger vision weight indicator to see if he has the optimum load. If not the operator can decide to go back down further to get max load of fluids per run. This is very important because all wells are different. Some have gas pressure “help” others do not. Some have a mixture of fluids and gas mixed with the length of the column. With Tiger Vision, you know loads and take appropriate action to get or lift maximum loads at each run. Without Tiger Vision, the operator can only guess how much load or length of the column of fluid. If a well is “gassy” or has “gas help”. 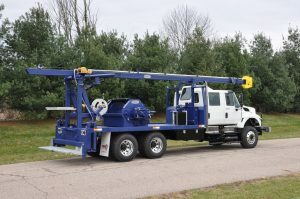 The operator will not know if he could have lifted a longer heavier column or not until it unloads at the top and finds less fluid and more gas than expected. Then it is too late. He loses Efficiencies. Then it is too late to get maximum loads. On future runs, the operator will guess again until Finely all fluid is out of well. Tiger Vision allows the operator to get max loads and therefore “unload” or “dry up” the well. 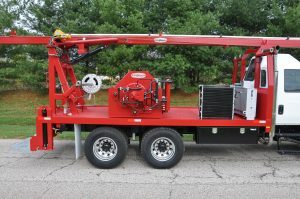 The well with fewer runs and less operator time, therefore, fewer costs to well owner. The Operator Looks Good! 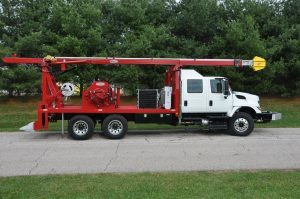 As tools are lowered into the well, line speed data helps operator maintain safe speed rate into the well. This helps prevent “bird caging” the cable. This is especially critical when running Dycam cables with Swab Master Special “Swab Under Pressure” Machines. If the well “kicks off” while the operator is coming out of the well the weight indicator will show weight Unloading. This shows the operator a potential blow out situation sooner than any other method. This allows the operator more time to “shut the well in” before the tools are blown out of the well. One Swab rig in the USA. Swab Master Machines. By Tiger General LLC. Fill out your information below and we'll respond promptly to give you more information about our Swab Master Rigs.